Don't forget! Tuesday is the last day to enter our current giveaways posted at the top of the page. Easy entries until 10pm Tuesday night! Since we moved from the city almost 5 years ago, we've been living on a single income. Higher living expenses and less pay. One of the ways we've changed our spending is to only buy meats when they are on sale rather than just because we're in the mood for a particular meal. Chicken is pretty much the only type of meat we have in the freezer at all times. Regardless of it being on sale or not, chicken is a must have item in our home since it's the only meat (and one of the handful of foods) Grace will eat. The last two times our local market had boneless chicken breast on sale, Joe bought 2 packs each time. Last week, we still had 3 family-packs in the freezer. While I planned on poaching 2 of the chicken breasts for Grace, I wanted something a little different for us adults. Joe and I both like dishes that contain rice and/or beans, so I knew I wanted to try the Chicken, Pinto Bean and Rice Casserole that I saw posted over at Family Balance Sheet. Since I wanted to keep the grocery bill low last week, I decided to make a few substitutions based on what I had in the pantry and what I was in the mood for. My only concern for this dish was that the rice wouldn't turn out. Sometimes I'm rice-challenged, meaning it doesn't always turn out the way it should. But, in this case, the rice cooked perfectly! 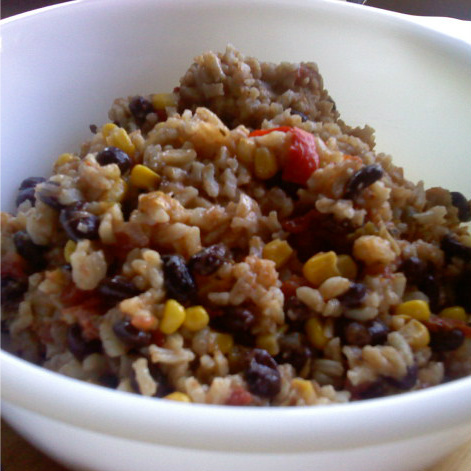 The photo below is just of the rice and bean mixture. By the time I got dinner on the table, I was too hungry to worry about snapping a photo. When I finally remembered to snap a picture of the leftovers, the chicken had already been eaten for lunch earlier that day. In a 6-qt. dutch oven (or large, oven-safe pot), heat oil over medium heat. Add chicken, cook for about 5 minutes per side. Remove chicken from oil and set aside. Add the diced pepper, onions and garlic to the hot oil and cook until tender. Stir often, making sure to scrape the bottom of the pan to loosen any bits of browned chicken. Stir in the spices, broth, beans, Rotel, salsa and corn. Bring to a simmer, then add rice. Cover and move pot to the oven to continue cooking for 20 minutes or until rice is tender, liquid is absorbed and chicken is cooked through. Serve as is or topped with your choice of sour cream, shredded cheese or salsa. I loved the addition of the chili powder and corn to this recipe. Definitely one of our favorite combinations. As stated in the original recipe, you can use whatever variety of beans you like. While I would have loved to prepare this with pinto beans, I didn't have them in my pantry. Black beans worked wonderfully, especially with the corn! The original recipe called for chicken thighs, I used chicken breast since that's what we had in the freezer. I would definitely consider either using thighs as originally suggested or even possibly marinate the chicken breast overnight, to keep it from drying out. I even think cutting the chicken into bite-sized pieces before cooking would be a great in stretching the chicken a bit further once it's stirred into the rice and bean mixture. This recipe is a keeper and we'll be making this again keeping in mind the chicken suggestions stated above. We loved that this recipe made a lot! Also, suggested over at Family Balance Sheet: the rice and bean mixture makes a great filling for burritos! This looks very yummy even without the chicken. My brother and I love Mexican dishes, so this sounds like one we would enjoy. Thanks so much for joining us at Your Cozy Home Party so others can find your yummy recipe.